I just received an email from Patty Segovia at AllGirlSkateJam.com. Patty organized the All Girl Skate Jam Demo in 1990 as a way to recognize female skateboarders. In 1996 after graduating from UCSB Patty Segovia created the first professional all girls skateboard contest. This began the annual AGSJ skateboard events which have spanned the globe from the North Shore of Oahu to San Sebastian, Spain. Going on 20 years the event is featured every summer on the Vans Warped Tour. 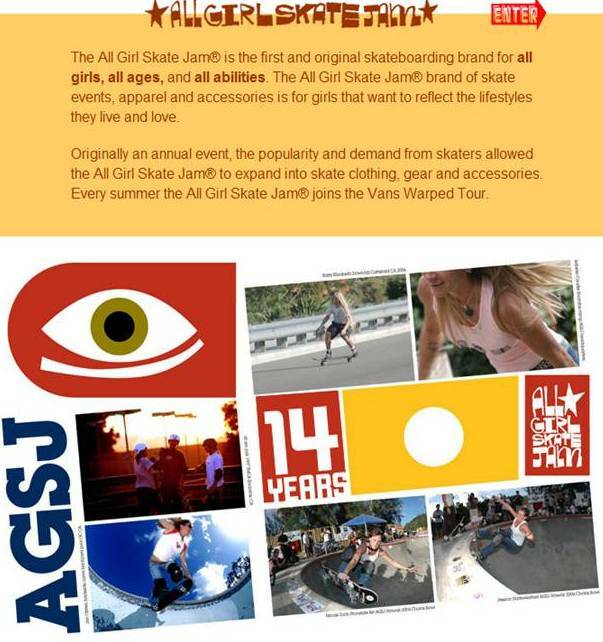 The AllGirlSkateJam.com and Patty are organizing a contest on August 10th at Dominguez Hills in Los Angeles. They are also looking for a group of 3 girls who are friends. At least 2 of them must be able to skate. According to Patty, you don’t have to be as good as Lyn-Z, Lizzie or Allysha, but just be able to ride a board. If you want to participate, just make a 5 minute video of you talking about your life - challenges, successes & worries but most of all your dreams!